These are great treats to help you “crowd out” the Halloween candy! But seriously, these Chocolate Mint Balls are addictively delicious. And not in a bad way because they’re gluten free and Paleo too. 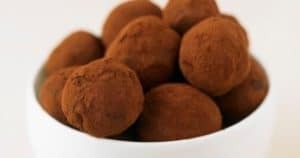 Of course that’s no excuse to eat the entire batch at one time, but it does mean these perfectly delectable little balls of goodness are a great alternative to many other holiday treats. Place all ingredients in food processor; pulse and blend well. The mixture should have the consistency of peanut butter. Use your hands or a melon baller to form mixture into one-inch balls. Dust in cocoa powder or crushed nuts if desired. Place balls into mini muffin cups in a mini muffin tray (the tray just keeps them from sliding around as you fill the cups!). You can leave the mixture as a round ball or press it into the muffin cups. Remove the filled muffin cups from the tray and place them in a re-sealable storage container using wax paper in between layers. Place in freezer for at least an hour. Serve cold or at room temperature.